Many inhabitants of old houses face a problem of the fact that the deal wooden floor begins to creak over time. Such floors usually lie on the logs which are over a concrete plate, eventually become loose and when walking on them begin to creak. Especially it becomes noticeable and irritates at night when you try to pass quietly about the room and to a corridor, a floor creaks, and you finally awake relatives. In the first case wooden whetstones or logs were laid on the concrete floor, at the same time the distance between them made about 40 cm. Over them the covering consisting of a layer of chipboard or plywood, from above which the covering from sheets DVP was located was placed. In the second option over fixed on a concrete plate a log wooden boards fastened. In both cases horizontally located logs representing wooden whetstones up to 4 cm thick and forming a basis for stacking of a covering were used. By means of such whetstones the necessary technological space from a concrete plate allowing a floor “to breathe” was created. At the same time the upper covering was beaten to internal beams by means of ordinary nails. Eventually during operation of a nail became loose, and boards began to be deformed and creak. Logs can be loosened too therefore cease to provide a dense fastening of a floor with concrete. What to do if a floor creaks? If you want to get rid of an importunate scratch of floors, then for this purpose there are several methods. That the wooden floor didn’t creak, its complete replacement will be the simplest and radical method. In that case new floors will serve long time without the need for additional repair. But it will run absolutely into money. First, except replacement of floors, most likely it is necessary to do complete repair in the apartment, and secondly, money for materials, their delivery and payment of work of masters will be spent. It is possible to choose of course inexpensive option of a covering, but anyway additional expenses will be big. The popular solution of replacement of an old wooden floor is the coupler over which the covering creeps, at the same time the tile, linoleum, a parquet, a tree or a laminate for choice can be used. But floors from a tile or linoleum, though have the mass of advantages, without additional layer or heating will be rather cold that isn’t really convenient, especially if in the house there are small children. As an additional layer it is possible to use expanded clay, GVL or extruded polyfoam, but it will be much more expensive, and installation of such floors will take more time and forces. If you have no sufficient funds for complete replacement of a floor, it is possible to change only a covering, having put plywood and having fixed it by self-tapping screws, but if old logs are in bad condition, also their replacement will be necessary. It is necessary to remove all the same completely a covering and to change it, and finally it will turn out just updated floors of the same quality, as well as old. Over time such floor can also begin to creak. 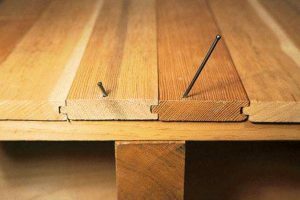 If floor boards creak, then will be to fix by the cheapest option them on self-tapping screws especially as it is possible to make it independently. At the beginning it is necessary to be determined at what distance from a concrete plate there is an old flooring. For this purpose it is necessary to drill a small opening with a diameter about 4 mm in a floor and to measure depth, it is possible to make it by means of a wire. Then it is necessary to purchase self-tapping screws of such length that they completely entered a floor and didn’t stick out on a covering surface. The following stage is determination of a location a log, it is possible to make it on old nails or having torn off a plinth near one of walls. Then in a floor openings slightly less than diameter of self-tapping screws on which by means of the screw gun all boards of a floor one after another are fixed are bored through. Also in order that a floor didn’t creak, apply one more method. For this purpose it is necessary to take self-tapping screws of the same length, as distance to a concrete plate, previously to cut off from them the sharp end and just to twist in a floor. They will create an additional support and a floor will cease to creak. It should be noted that these two methods are good if logs didn’t rot through and are well snugged. If logs “walk”, then it is possible to fix in addition them by big expansion bolt shields directly to a concrete plate. 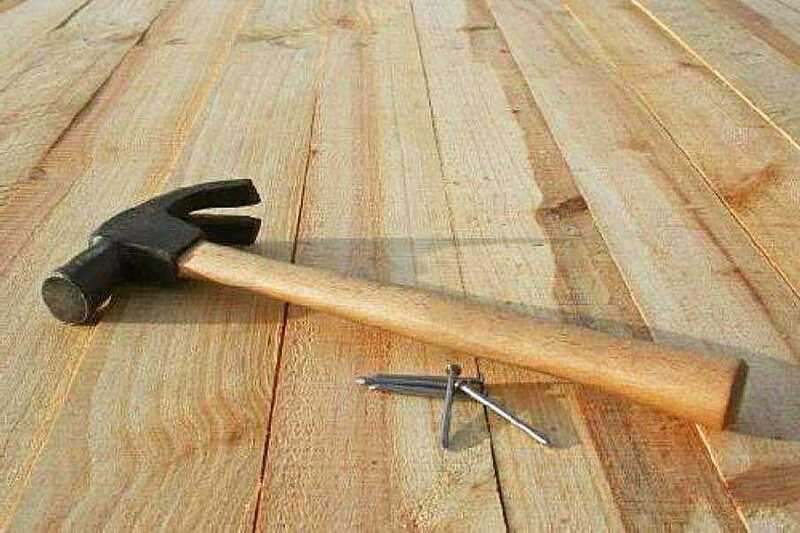 Friction of boards can be one more reason that a floor in the apartment creaks, in that case between them it is possible to hammer small wooden klinyshka.